Put the flour, salt and butter in a food processor and whiz to fine crumbs. Tip into a bowl and add the egg yolk and enough cold water to bind the dough (about 2 tbsp). Lightly knead on a floured surface, then roll out and line a deep, 20cm tart tin with a removable base. Prick the base with a fork, line with greaseproof paper and baking beans. Chill for 30 minutes. Preheat the oven to 200°C, gas mark 6. Put the pumpkin in a saucepan with the water. Bring to the boil, cover and simmer until the pumpkin is very soft and the water has evaporated. If necessary, add a little more water as it cooks but you need the final mixture to be quite dry. Purée the pumpkin and cool. Bake the pastry for 10 minutes, remove the paper and beans and bake for 8-10 minutes more or until it no longer looks raw. Reduce the oven to 180°C, gas mark 4. Mix the pumpkin with the sugar, lemon zest, brandy and spices. Beat together the egg yolks and cream and add to the mix. Pour into the pastry case. Bake for 30-40 minutes or until just set with a slight wobble. 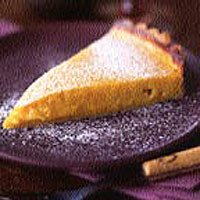 Serve warm or cold, dusted with icing sugar.